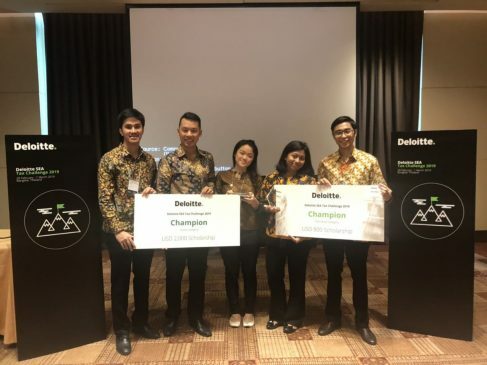 The Faculty of Economics and Business UI (FEB UI) won achievements in the category of groups and individuals in the ASEAN round of Deloitte Tax Challenge (DTC) activities held at Eastin Grand Hotel Sathorn, Bangkok, Thailand from 28 February – 1 March 2019. The FEB UI team, The Four Horsemen, won the first place in the Business Challenge category. In this category, each team is given 90 minutes to work on a case study on a particular theme, to be presented in front of the jury. The topic raised by The Four Horsemen is regarding Transfer Pricing Documentation. With this victory, the Four Horsemen team consisting of 4 2015 accounting students, namely Muhammad Farhan Riansyah Putra, Michelle Priscilla, Namira Suniaprita, Nathanael Abednego were entitled to cash prizes of USD 2000. “We are very grateful to have the opportunity to experience this. We hope that FEB UI will represent the Indonesian Team on the SEA DTC in the coming year and can feel the experiences that I and my friends feel. The point is, never be afraid to try new things, “said Farhan. In addition to achieving achievements in the group category, FEB UI also won achievements in the individual category, namely 1st Place Best Writer. This category was won by Gede Sthitaprajna Virananda, who is a student of FEB UI 2016 Economics. “For the presentation, I was asked to provide an analysis and recommendation on whether the Indonesian Ministry of Finance needs to adjust the regulation of thin capitalization with recommendations from the OECD, where the ratio rule used is the ratio of net interest expense to EBITDA compared to Indonesian regulations using the debt to equity ratio,” said Jana. According to Jana, the Deloitte Tax Challenge is a tax competition that trains presentation skills and analytical and structured thinking, not just related to tax content. DTC is a routine activity held in order to encourage students as academics to think creatively and excel. Each team of contestants is challenged to have experience handling real business cases with various investment cases, restructuring, domestic and international taxation issues and so on. PT Deloitte Consultant Indonesia is part of Deloitte Touche Tohmatsu Ltd which is the second largest firm in the world in the field of professional services after PricewaterhouseCoopers. In Indonesia alone, the management is under Deloitte Southeast Asia Ltd, which also oversees other offices in Brunei, Guam, Malaysia, Philippines, Singapore, Thailand and Vietnam.